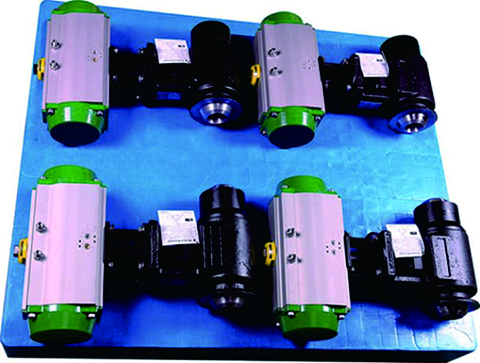 The series of GKPV pneumatic high-pressure condensate valves that our company offered for State Power Corporation of China in Madian power plant is performed well. The series of GKPV ball valve is mainly used in the boiler drains, steam turbine drainage, upper and lower seat hydrophobic, feedwater hydrophobic, steam manifold exhaust, superheated exhaust and hydrophobic, soot blower, bypass isolation valve, manifold hydrophobic economizer and other systems in the power plant; its feature: Because the material of ball and seat is Inconel 718, it is complete matched and 100% driving fit to ensure completely closed and anti-corrosion. Because it’s separated from the turbine in the switch position, the seat is protected; Carbide coating advantage of melting chromium layer: resistance to thermal shock, frequent operation applications, crush, maintaining the strength of the base metal, anti-erosion; Stem and packing configuration: live load, 1/4 rotation and lift non-stem is not damaged with packing, wide face stuffing, green composite anti-extrusion packing reign; Mechanical limit seam allowance: Prevent the ball rotated 180 degrees, to prevent deviate; Seat spring: auxiliary to pipeline pressure, provide continuous sealing force between the ball and seat, thereby maintaining seal.